Android development doesn’t always have to look like this. Smaller developers without their own in-house QA departments often outsource their testing to services like Testdroid, for example, which tests their Android apps on physical devices. But today, Testdroid and the like will have some new competition from a company called AppThwack, which plans to not only match Testdroid’s capabilities, but will go even further in terms of the number of automation frameworks it supports. Currently, Testdroid supports more devices than AppThwack, which only has 60 to Testdroid’s 100+. But, points out AppThwack co-founder Trent Peterson, they’ve managed to go from zero to sixty in just three months. And, he adds, you don’t need to have every device in order to cover the majority of the market. That said, AppThwack is still adding more devices to the service at a rate of about five per week. Peterson and his co-founder Pawel Wojnarowicz formerly worked at Intel, where, for nine years, they focused on automating distributed systems for Wi-Fi, WiMax and Bluetooth. In March 2012, they decided to quit and begin building AppThwack. Originally, the idea was to build a distributed automation platform and market that as the company’s flagship product. “But it quickly became apparent that two guys with an unproven automated platform that’s fairly generic is nearly impossible to market to enterprise,” says Peterson. So they shifted into Android testing instead, using the automation platform as the base and building AppThwack on top of it. “The goal is to allow developers to see how their apps are performing on devices before they ever hit an actual end user,” he says of the new product. Instead, AppThwack’s closest competitors will be the services that automate the testing process on actual hardware. Peterson identified his closest competitor as the above-mentioned Testdroid, but notes that Testdroid is focused on Robotium, the Selenium-like testing service designed for Android. With AppThwack, Robotium will be supported, but it will also support Exerciser Monkey and it will randomly test the UI by taking screenshots in both portrait and landscape modes. “We didn’t design around Robotium or design around Exerciser Monkey, everything is very modular,” says Peterson. “And as we get new requests there are a couple of other automation frameworks for testing Android devices, and we’re adding these in as we go.” He mentions monkeyrunner, MonkeyTalk, and Calabash as those under consideration. Implementation will be based on demand. In addition, the company is adding support for web testing, too. Right now, it loads URLs and takes screenshots in a variety of browsers, but it will become a more robust service in time. 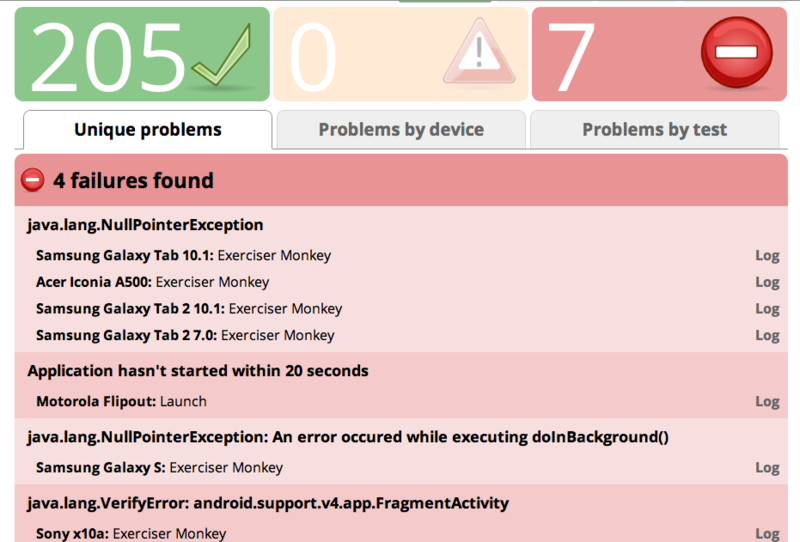 After tests are run, developers will be provided with easy-to-read reports, like these examples here: Android, web. AppThwack will be a freemium service, but until pricing is worked out, it’s free. There’s also an option for bigger shops to install the framework in-house, if they choose. Sign-up is here.